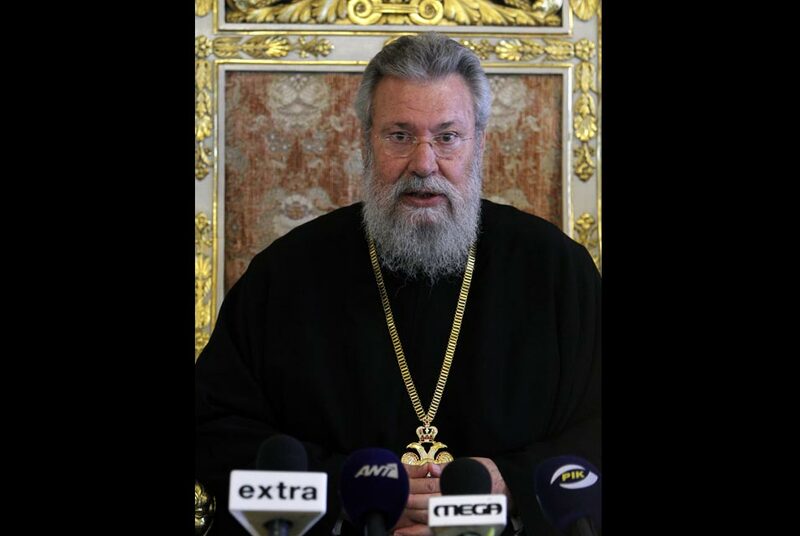 Cyprus' Orthodox Christian church Archbishop Chrysostomos II speaks to the media during a press conference in divided capital Nicosia, Cyprus, Friday, Sept. 30, 2011. Chrysostomos says rare 13th-century frescoes are to be returned to Cyprus from an American museum where they have been exhibited for the last 28 years. Antiquities smugglers looted the frescoes from a church in northern Cyprus following a 1974 Turkish invasion that split the island into a Turkish-speaking north and a Greek-speaking south. AP Photo/Petros Karadjias. NICOSIA (AP).- Rare 13th-century frescoes are to be returned to cyprus from an American museum where they have been exhibited for the last 28 years, the leader of the divided island's Orthodox Christian church said on Friday. Archbishop Chrysostomos II says the Houston-based Menil Collection agreed to return the Byzantine frescoes early next year on the church's insistence not "to allow them to remain there even for one second longer." "I salute this decision by the Menil Collection because embarking on a court battle would honor neither us nor the Collection," said the Archbishop. Antiquities smugglers looted the frescoes from the Ayios Themomianos church in northern cyprus following a 1974 Turkish invasion that split the island into a Turkish-speaking north and a Greek-speaking south. Menil Collection founder Dominique de Menil obtained the frescoes in 1983, and struck an agreement with the cyprus church to keep and exhibit them in a purpose-built chapel in Houston. A decade later, the cyprus church granted the museum a loan extension until Feb. 2012 in recognition of its efforts to reassemble and restore the fragmented frescoes. But Chrysostomos said that he has turned down additional requests to keep the frescoes longer, offering instead to dispatch an iconographer to recreate them on the chapel's dome and apses, along with a gift of ten late-19th and early-20th century icons. The frescoes depict Christ Pantocrator surrounded by a frieze of angels, as well as the Preparation of the Throne attended by Virgin Mary and Saint John the Baptist. Another section depicts the Virgin flanked by Archangels Michael and Gabriel. cyprus Antiquities Department Director Maria Hadjicosti said officials will oversee the entire operation to transport the frescoes back to the island. The church says scores of religious artifacts, including icons and mosaics, were looted from Greek Cypriot churches in the island's north. Many have since appeared on the international art market. Chrysostomos said "millions" have been spent purchasing them with the purpose of repatriating them. The church's biggest success was the recovery of several priceless 6th century mosaics. "We'll rest only when all our antiquities, all our ecclesiastical objects return to where they belong," he said. Christianity in cyprus stretches to the faith's earliest years. The Apostle Paul is said to have preached the gospel in cyprus in A.D. 45 and converted the island's Roman governor Sergius Paulus  the first Roman official to undergo conversion.